KATHMANDU, June 15 : Fifteen-year-old Aditya Khadka’s documentary ‘Dhartiputra’ has been selected to be screened at two film festivals in the US. The documentary, which is four minutes and 30 seconds long, was the third prize winner in the Seismic Shift category of KIMFF 2015. It will be screened first at the three-day Scout Film Festival in Vermont on June 18. 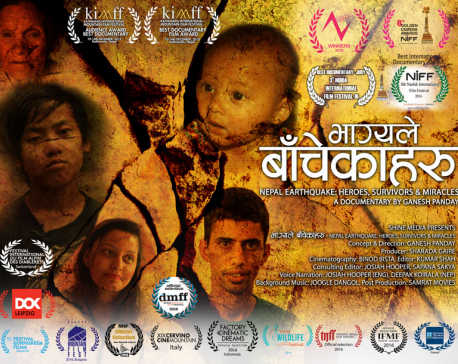 Khadka’s ‘Dhartiputra’ is one of the films from over 20 countries being screened at the festival. On July, ‘Dhartiputra’ will be showcased at another American film festival. The 39th Asian American International Film Festival (AAIFF) 2016 will commence on July 21 in New York. 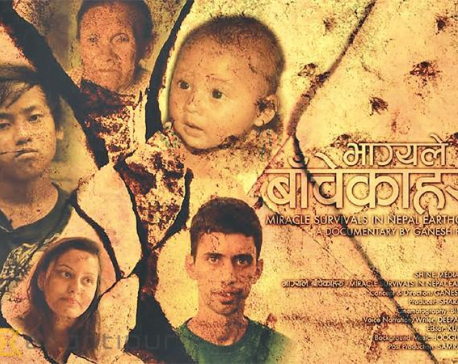 In ‘Dhartiputra,’ Khadka tells the story of four-month-old Sonis Awal who was rescued alive after 22 hours. He was buried under the rubble of his five-story house in the April earthquake last year. The documentary focuses on Sonis’ mother Rasmeela who recounts her feelings and emotions during those fraught 22 hours and after her son was rescued. This is Khadka’s third documentary after ‘A dream to be’ which he made when he was 13 and ‘Dusk to Dawn’ at 14 years of age.